Spring time brings and abundance of fresh produce in the local supermarkets and farmer’s markets . I am always looking for meals that take less cooking in the kitchen, and mostly raw if possible.Such is the case with spring vegetables, which are perfect for leaving raw, keeping the nutritional value intact. Using a spiral vegetable slicer. It gives good noodle.This handy little gadget is much easier to use than a mandoline or vegetable peeler. You can purchase a GEFU Spirelli, Spiral Slicer or a Paderno World Cuisine Spiralizer, which is another incredible kitchen gadget perfect for spiralizing all sorts of hearty vegetables like sweet potatoes, beets and butternut squash into noodles. But if you don’t have a spiral slicer, you can simply grate the carrots with a box grater to make this recipe. You can even spiral carrots. 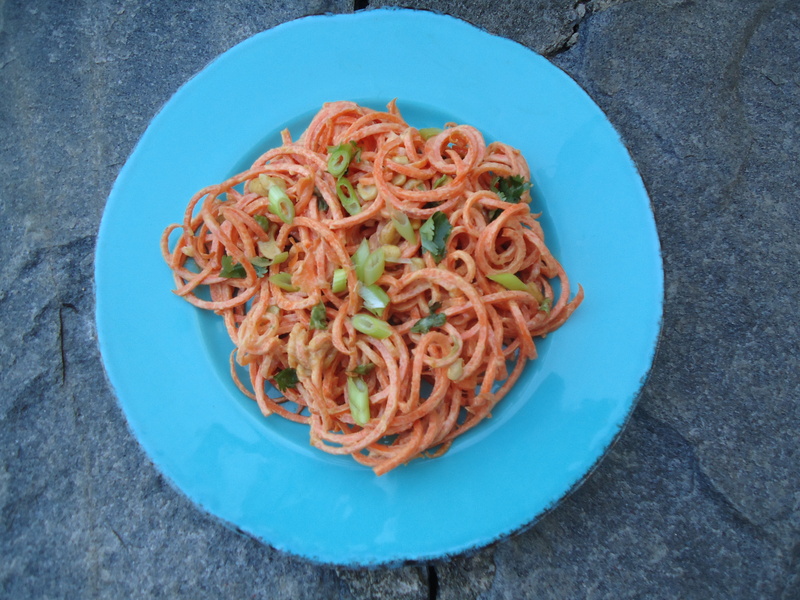 Carrots remotely taste like pasta, but as a vegetable, it can offer a vegetarian, paleo option for those looking for something off the beaten path.The carrot noodles are crisp and fresh and the ginger-lime peanut sauce makes your taste buds spin. And the bonus is that recipe is ever so simple and requires zero cooking, because let’s face it, who wants to spend time over a hot stove during this time of year. Also, this is the perfect dish for “Meatless Mondays”. 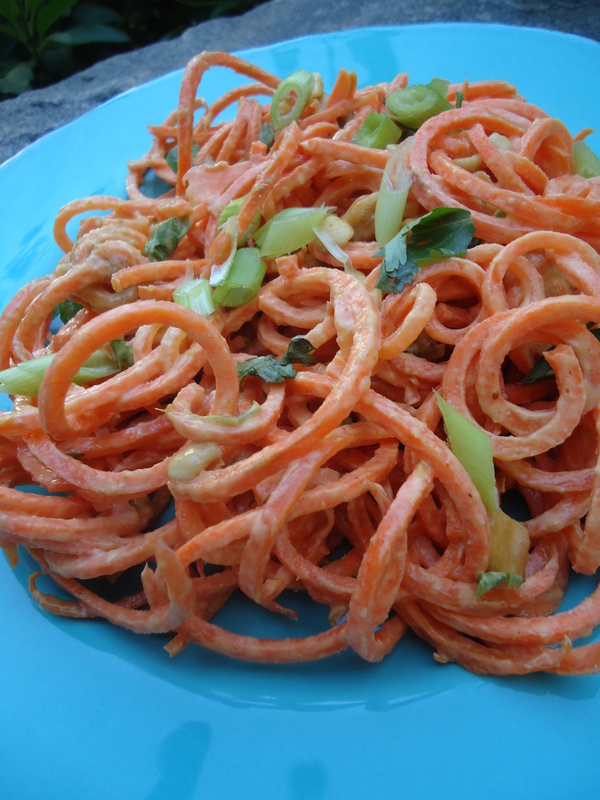 Wash carrots well, peel them, and pat them dry.Using your spiral slicer, make noodles out of all of the carrots. It will be more difficult to make the noodles once there is only a few inches of carrot left, so you can grate what’s left of the carrot. To serve, place the carrot noodles into a large serving bowl. Pour the Ginger-Lime Sauce over the noodles and gently toss together. Garnish with roasted cashews or peanuts, scallions and freshly chopped cilantro.